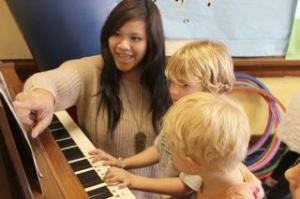 Dancing Fingers, Hands and Bodies get MOVING in this introduction to piano and instruments class! $95 a month + $ Music Home kit (price varies per semester from $25 to $75 for cd, book, instruments, folder and practice sheets). A full semester commitment. There are 4 consecutive semesters. Mon at 4:15 PM starts 4/1/19 AKU Semester 1 5-8 George SB Kindermusik Studio @1st United Methodist Church $95.00/m Register! Tue at 3:30 PM starts 4/2/19 AKU Semester 2 5-8 Kathy SB Kindermusik Studio @1st United Methodist Church $95.00/m Register! Wed at 5:15 PM starts 4/3/19 AKU Semester 3 5-10 George SB Kindermusik Studio @1st United Methodist Church $95.00/m Register! Thu at 3:30 PM starts 4/4/19 AKU Semester 4 5-10 Kathy SB Kindermusik Studio @1st United Methodist Church $95.00/m Register!